100 Voices is one of the projects associated with the Pennsylvania Grand Review. The Pennsylvania Tourism Office selected 100 African Americans who fought in the United States Colored Troops during the Civil War. Many of these veterans were either born or buried in Pennsylvania. Each person in this list has a record on House Divided – click on that person’s name to see it. 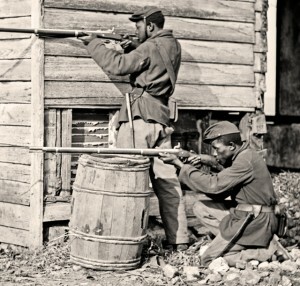 The 3rd USCT Regiment, which was organized in August 1863, was the first unit to receive training at Camp William Penn, located outside of Philadelphia. (You can read about this regiment’s flag raising ceremony in a previous post). The War Department initially sent this regiment to South Carolina, where it was involved in the campaign to seize Fort Wagner. Read more about this regiment here. The 6th USCT Regiment was composed mainly of Pennsylvania men, and was organized at Camp William Penn between July and September 1863. In October, the regiment was assigned to the Army of the James and stationed near Yorktown, Pennsylvania. The regiment was also part of a plan to release Union prisoners from Belle Isle near Richmond, Virginia. After a grueling march in early February 1864, the Union forces arrived to find the Confederate forces prepared to meet them, and the battle was lost. Read more about this regiment here. The recruiting for the 8th USCT Regiment began in September 1863 at Camp William Penn, and the regiment was deployed to Florida on its first assignment in February 1864. After a time of looting supply lines and taking prisoners, the regiment finally encountered resistance at the Battle of Olustee. This battle incurred some of the heaviest losses (percentage-wise) of the Civil War, and the 8th USCT played an integral part. Read more about this regiment here. The 22nd USCT Regiment was organized in January 1864 at Camp William Penn in Pennsylvania. The regiment joined the Army of the James, Eighteenth Corps near the end of that month, and was assigned to construct earthworks along the James River for protecting supply lines. In June, the Eighteenth Corps participated in the siege of Petersburg, for which the 22nd USCT regiment received great acclaim. Read more about this regiment here. The 24th USCT Regiment was organized at Camp William Penn on February 17, 1865. In May, it was stationed at Camp Casey in Virginia outside of Washington, DC; then in June it was moved to Maryland to guard Confederate prisoners. The regiment’s final assignment was preserving order and distributing supplies in and around Roanoke, Virginia between July and September 1865. Read more about this regiment here. After being organized in January 1864, the 25th USCT Regiment was deployed to Texas, although it never reached its intended destination. The steamer that carried the regiment was caught in a storm and sprung a leak, and the men barely kept her afloat long enough to dock safely in the North Carolina harbor. The regiment arrived in New Orleans in May 1864 just as the Confederates were gaining the upper hand in the Red River Campaign. Read more about this regiment here. 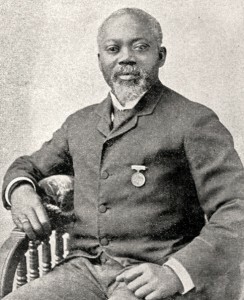 Samuel Gardner served in the 27th United States Colored Troops Regiment. The 32nd USCT Regiment was organized in March 1864 at Camp William Penn outside Philadelphia. After training was completed, the regiment was sent to South Carolina in late April 1864. These men participated in a number of engagements while assigned to the Department of the South. Read more about this regiment here. 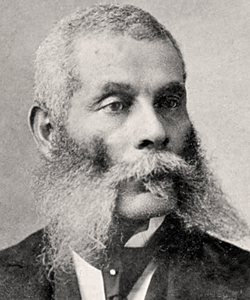 Ephraim Slaughter served in the 37th United States Colored Troops Regiment. The 41st USCT Regiment was organized at Camp William Penn in the fall of 1864. This regiment participated in several engagements in Virginia. Read more about this regiment here. After being assembled at Camp William Penn, the 43rd USCT Regiment, composed mainly of Pennsylvania recruits, was assigned in April 1864 to the Ninth Corps of the Army of the Potomac. Continuing on through Washington, where the African-American regiment “attracted special attention,” the regiment became involved in the Wilderness Campaign in rural Virginia. Read more about this regiment here. The 127th USCT Regiment was organized in September 1864 and received training at Camp William Penn. Records indicate that this regiment only participated in a single battle. Read more about this regiment here. Read more about this regiment here.